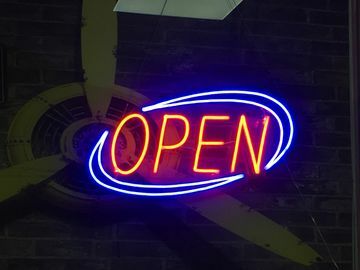 brightness intensity, our LED neon OPEN sign will let your business outshine others. Every passerby in the street is a potential customer, gains their attention and increases the walk-in rate and your sale will rise in no time. 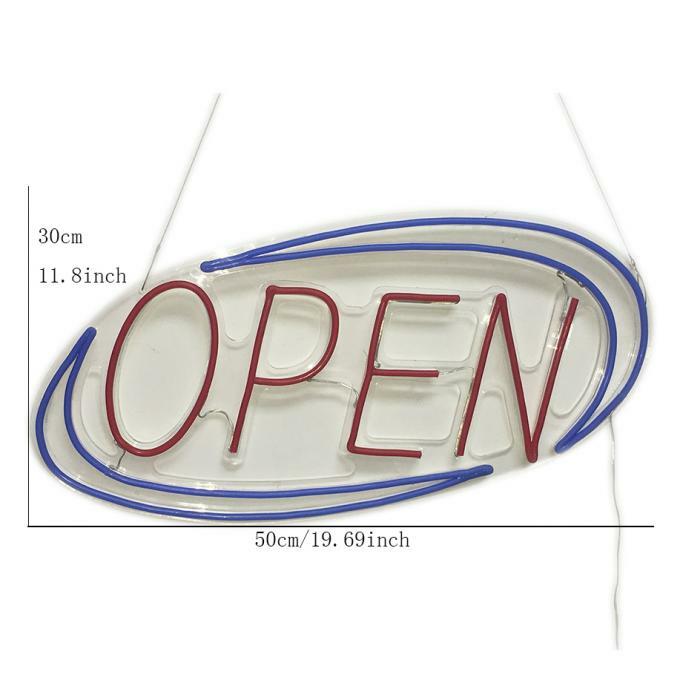 · BRIGHT & LIGHTWEIGHT: 19.7” x 10.8” perfect size, bright enough and lightweight LED neon display board with 9.8ft cable wire allows you to move and put the sign further and higher with less restrain. · LONG LASTING AND RELIABLE: High quality LED modules lighting panel, energy efficient, and are environmentally friendly. the letter font showing clearly, can be seen even far away, more durable and lasting than traditional individual LED beads. 2 year warranty, satisfaction guarantee,. Long lasting means they will retain their brightness and will require little to no maintenance. · EASY TO INSTALL: No complicated set up or installation. Just affix the hanging chain, plug in the built in power cord, and press the power switch to immediately brighten up your storefront window, even through tinted glass. · ATTRACT BUSINESS: Perfect for use inside barber shop, bar, hotel, restaurant, liquor store, food truck, spa, beauty or hair salon, office, gas station, boutique, coffee shop or any other kind of street store. Outshine your competitors with this lit panel and get both new and returning shoppers flocking to your business. 2 Year Manufacturers Warranty - We stand behind this Neon Sign with a 2 Year warranty which will cover any malfunction or failure of the electrical components on your sign, as well as against defective controller, during the warranty period. Ease of Use - All of our Indoor Neon Signs will arrive as complete plug and play units. All components are integrated onto the neon sign and no assembly or special wiring is required. 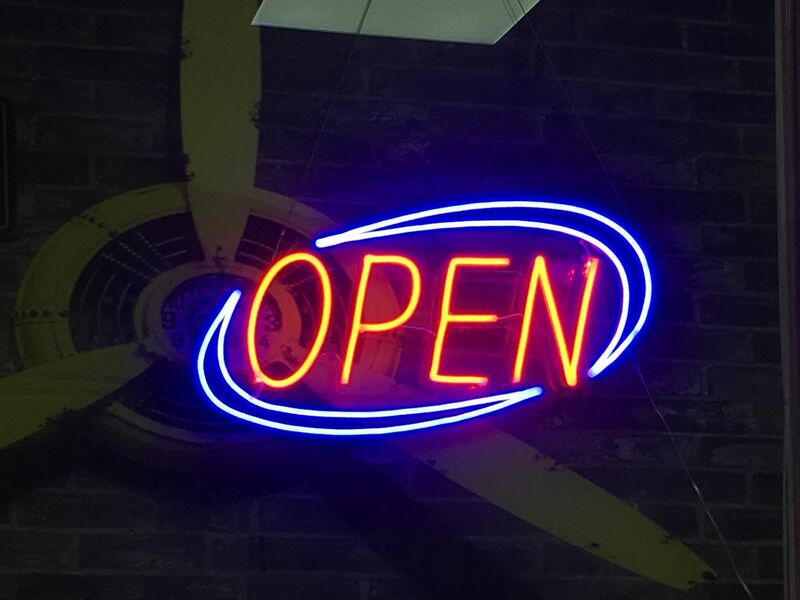 Upon arrival, you can simply unpack and hang up your indoor neon sign (mounting hardware is included), plug it into a standard outlet, and instantly view your new sign!. There will be no need for an expensive sign installer or electrician, and if questions do arise, help is just a phone call away! Each neon sign includes a U.L. Listed power supply which has a 6.5 ft electrical cord.